JAGNA – The Local Government Unit of Jagna and St. Michael the Archangel Parish are in the thick of preparations for the coming 385th Foundation Day and Fiesta celebration in honor of its patron St. Michael the Archangel on September 28-29, 2016. This year’s theme is anchored on the LGU’s new vision and the church’s theme combined to come up with LIVABLE JAGNA: A COMMUNITY FOR CHANGE, A CHURCH OF MERCY. Tradition dictates that the Jagnaanons celebrate its foundation and fiesta with gaiety and merrymaking as well as a look back into the past towards Jagna’s evolution up until the present. Religion has played a major role in the cohesiveness of the Jagnaanons. It is a vital factor in the successful fusion of culture and tradition with reality and practicality. The Local Council for Culture and the Arts (LCCA) has since June planned the major activities for this year’s foundation and fiesta. Topping are the major highlights: 9-day novena and nightly entertainment starting September 20, Tabo sa Jagna opening on September 23, SAKAY SAKAY 2016 and SINUOG ESTOKADA – a religious and cultural showcase on September 29. 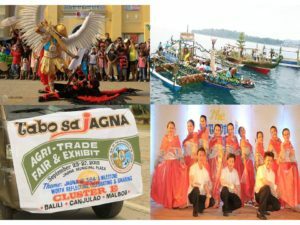 This year’s foundation day and fiesta celebration is expected to draw in visitors to the town to witness the different activities the Jagnaanons have prepared. The LCCA chaired by local chief executive Atty. Fortunato R. Abrenilla with the different committees – 9-day novena is spearheaded by the St. Michael the Archangel Parish; nightly entertainment by Vice Mayor Bonifacio J. Vurtudes, Jr. and Councilor Rodrigo Lloren; Tabo sa Jagna by Councilo Maricris V. Jamora and MAO Camilo Rizano; Sakay Sakay 2016 by Vice Mayor Boni facio J. Virtudes, Jr. and Rev. Fr. Tereso Lumacang and Sinuog Estokada by Ms. Lovella E. Acebes. The Jagna Tourism Office is in charge of the tourism aspect of the different activities headed by Ms. Teresa Gina Ranan.